This trek begins at the delightful Wonnangatta Homstead. It takes you through 8 river crossings and up some of the steepest terrain in the high country. There are many sections that appear to be vertical and they are loose and rocky. High clearance, low range, good off road tyres and plenty of courage needed for this one. Leave the wives and kids at home if you know whats good for you. The upshot is if your a fisherman there are lots of spots to throw a line in. 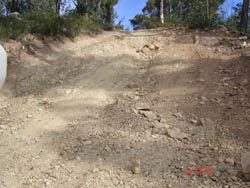 The trek climbs up Herne Spur to meet up with Wombat Spur then traverses back down to the Wonnangatta Flats. Along the way there is a nice short track that takes you up and on top of Bald Knob. This track requires a fair level of courage to go up and about a 30 point turn to get around and back down. If you have the experience take the time as it gives you completely unobstructed 360 degree views of the high country. This trip is best done in the morning.